detail: information that tells more about, explains, or describes the main idea. Students will be able to identify the main idea and supporting details in a text about the Transcontinental Railroad. Students will be able to identify the main idea and supporting details with subject nouns and pronouns using a graphic organizer. 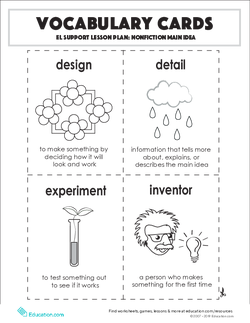 Tell students that today they will practice identifying the main idea and details of a nonfiction text. Ask students to think of what they know about the terms main idea and details. Have students share their background knowledge with a partner. Invite a few students to share their thinking and document their thoughts on a piece of chart paper. 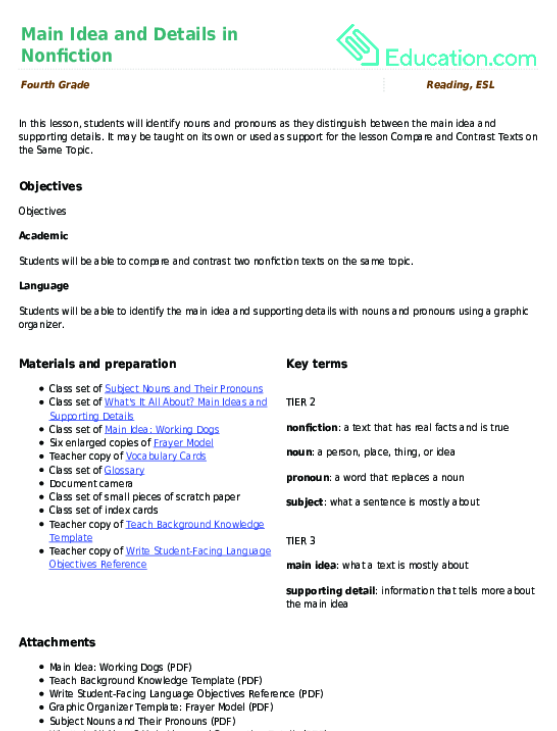 Inform students that they will spend the first part of the lesson learning some vocabulary terms. 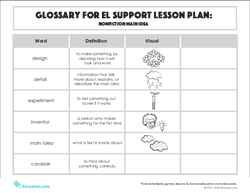 Distribute a Glossary to each student and display a teacher copy. Read aloud the first vocabulary word and definition, and describe the image when applicable. Invite students to read the remaining words and definitions. Tell students to write "Synonym/Example" in the last empty column of the glossary page. Model how you come up with a synonym or example of one of the vocabulary words (e.g. For the word design, you could write "make" or "create"). Note: Students are also welcome to draw a sketch of the word in this column if it helps them make meaning of the word. 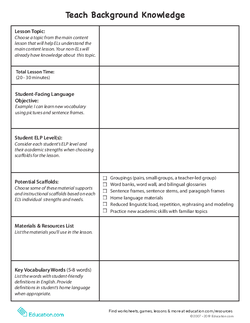 Instruct students to continue adding to the last column for all of the vocabulary terms. For students who are literate in their home language (L1), they may also write synonyms and examples in their L1. Have a few students share their additions to the glossary using the document camera. 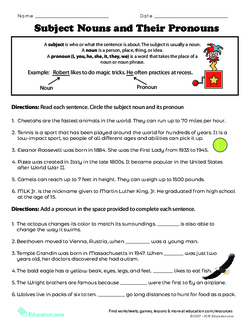 Distribute the Subject Nouns and Their Pronouns worksheet to students and display a copy on the document camera. Read aloud the teaching box at the top and invite a student to retell the main points of the box. Read the directions for the first section of the worksheet. Draw two columns on a piece of chart paper and label them "Noun" and "Pronouns." Ask students to come up with examples of nouns and write them on the chart paper under "Nouns." Then, assign the corresponding pronoun to each noun in the other column. 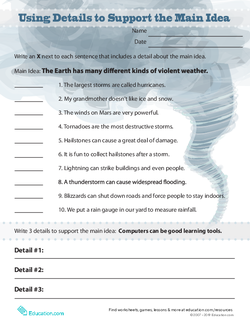 Return to the worksheet and model your thinking aloud as you identify the noun and pronoun in the first sentence. Explain that pronouns are important in nonfiction texts so that the reader does not have to read the same subject noun repeatedly. Have students continue the rest of the exercise independently. Circulate to offer assistance. Go over the answers as a class and correct any mistakes. Repeat this process (model, assign, review) for the second section of the worksheet. 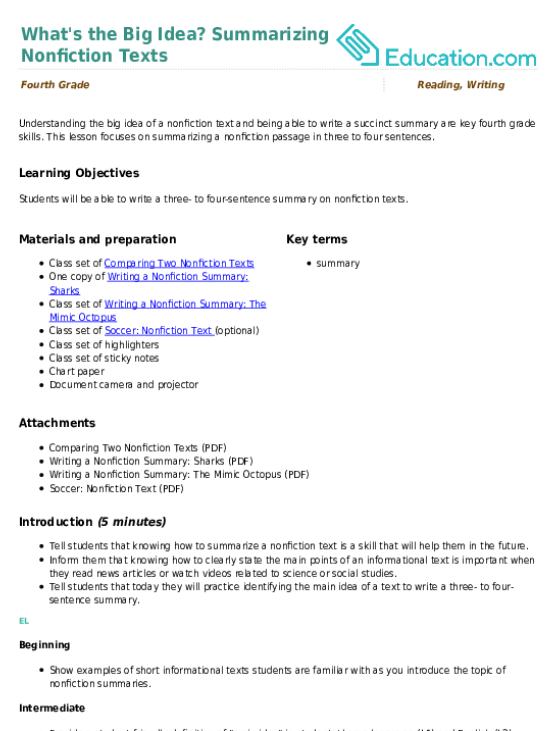 Explain to students that it is important to be able to identify the subject noun and pronoun in nonfiction text because they are often a major clue of what the main idea is. The subject of the first few sentences of a paragraph is often a key clue to the main idea of the text. 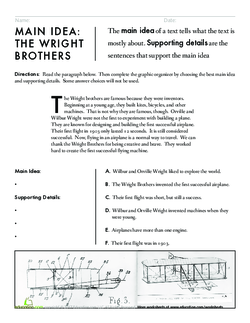 Hand out the Main Idea: The Wright Brothers worksheet to students and display a teacher copy. Invite a student to read the directions aloud. Conduct a choral reading of the paragraph with students. Instruct them to read it a second time on their own. Ask students if there are any unfamiliar words and define them in student-friendly terms (L1 and L2) as needed. 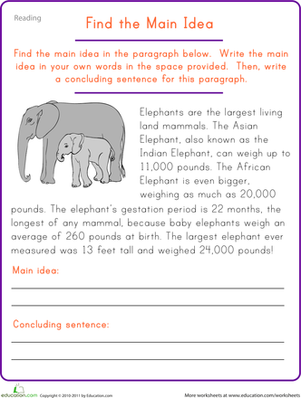 Assign students into pairs and tell them to circle the subject nouns and pronouns in the paragraph. Instruct students to work collaboratively with their partner to choose the main idea and supporting details. Review the answers as a whole group. Allow beginning ELs to work with a helpful partner. Pre-teach a separate lesson to a small group on nouns and their associated pronouns. Provide bilingual resources such as online dictionaries and glossaries for students to use to look up unfamiliar words. Allow students to complete the formative assessment with a partner. Have advanced ELs share their ideas first in class. Have students read and rephrase directions and word definitions to their classmates. Ask students find the main idea and supporting details of other nonfiction texts in the classroom. 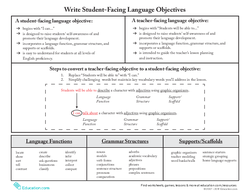 Pair students who speak the same home language together and encourage them to use the L1 to explain their reasoning. 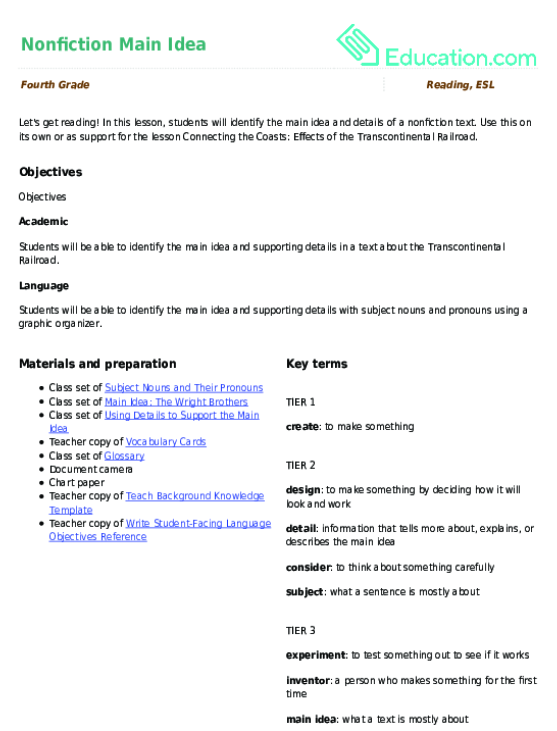 Pass each student a copy of the Finding the Main Idea worksheet. Read aloud the directions and the sentences for the first section. Clarify any unknown words for students and instruct them to complete the first section (marking X on details that support the main idea) independently. Note: For this formative assessment, we will not use the bottom section of the worksheet. Circulate to assist struggling students. Tell students that in today's lesson they focused on distinguishing between the main idea and the supporting details within a nonfiction text. Explain that this is an important skill in comprehending what they are reading. Tell students to verbally complete the sentence stems with a partner. Call on a few students to share their sentences.